Thank you to State Senator Rosalind Kurita (TN) who on February 5, 2007 introduced Senate Joint Resolution 31 into the Tennessee General Assembly. A RESOLUTION urging Congress to establish the Office of the National Nurse. BE IT FURTHER RESOLVED, that the Chief Clerk of the House of Representatives transmit an enrolled copy of this resolution to each member of the Tennessee Congressional Delegation. Thank you and kudos to Sandy Summers, the Executive Director of the Center For Nursing Advocacy who wrote "Buzz Saw", an opinion piece about the National Nurse article that appeared in the Oregonian last October. It might be nice to have a visible, single person as spokesperson...We would prefer to put our energies into actions that actually produce results. Since no one knows what resources Congress might devote to an Office of the National Nurse, the statement that the legislation will not "produce results" sounds like a general rejection of the type of public health education the bill envisions. However, generations of nurses, as well as public health figures like the Surgeon General, have done such education. King concedes that having a "visible, single" spokesperson might be "nice." In fact, nursing has few representatives with national public name recognition, in or out of government. 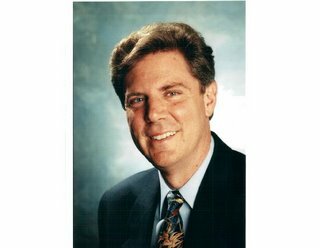 A highly qualified, articulate representative, with the authority of the federal government behind him or her, could increase understanding of the profession. Of course, much would depend on the size of the Office and how much funding was allocated. The likely efficacy of teams of volunteer nurses, when so many nurses are now stretched to the breaking point and beyond in their paid positions, is also debatable. The general public health mission of the National Nurse would seem to overlap somewhat with that of the Surgeon General and other public health offices. And of course, we would not want establishment of the Office of the National Nurse to be used as an excuse for failing to provide adequate government support to other vital aspects of nursing practice, education, and research. But with some resources, the National Nurse could help educate the public about the importance of nursing to patient outcomes, as well as the roles that resource allocation and working conditions play in the nursing shortage. In addition, there is reason to believe that even a small Office of the National Nurse could raise public awareness of some key health issues, especially if it could attract media attention." You should! It’s not about the valentines either. February is the month to increase awareness about women and heart disease. Why is this important? It’s simple. Heart disease continues to be the number one killer of women. Around 480,000 women die from heart disease-related deaths annually. Annually, about 88,000 women between the ages of 45 and 64 have a heart attack. That number increases to approximately 372,000 after the age of 65. Therefore, it is imperative that we continue to increase awareness about women and their risks for heart disease as well as ways to minimize their risks. So how do women reduce their risk? There are a variety of ways women can reduce their risks for development of heart disease. One is to know your numbers. That means that knowing your lipoprotein numbers, fasting glucose, body mass index, waist circumference, and blood pressure. Additionally, a new measure has been added to improve calculating a woman’s risk for heart disease. This new tool is called the Reynolds Risk Score. In addition to the aforementioned numbers, it also takes into account serum high sensitivity C-reactive protein, smoking and family history. C-reactive protein is a measurement of arterial inflammation. Additional ways to reduce your risk are basic lifestyle choices that will reduce a woman’s risk for developing heart disease. These include being physically active a minimum of thirty minutes a day. If you are overweight, strive to reduce you weight sensibly. Be sure to include healthy foods into your daily diet such as reduced saturated fats, trans fats, and cholesterol. Increase intake of fresh fruits and vegetables, fiber rich grain products, low fat dairy products, and lean protein. Not only will this reduce your risk for heart disease, but it will reduce your risk for diabetes as well. If you smoke, quit. There are a variety of resources available to help you. If you don’t smoke, avoid situations where you may be exposed to second hand smoke. How do you know if you’re having a heart attack? Here are a few of the more common signs: anxiety, dizziness, nausea, breaking out in a cold sweat, pain in the jaw, chest, shoulder, or neck, chest discomfort, shortness of breath, weakness and fatigue. Should you, or someone you know, experience any of those symptoms, call 911 immediately. Do not attempt to drive yourself to the hospital. All the information in this article was derived from the following organizations. For additional information on how to protect yourself or the women in your life, visit their websites and be sure to share the information. Thank you to the 3,000 health care professionals of the Oregon Federation of Nurses and Health Professionals Local 5017 (OFNHP) for its offer of support for the establishment of The Office of the National Nurse. OFNHP 5017 represents registered nurses, professionals including affiliated clinicians, registered dental hygienists, many disciplines of technical employees, and lab professionals that include medical technologists. OFNHP 5017 supports the establishment and permanence of policies and programs that provide primary and preventive health care for all. Bridging the gaps in healthcare to meet the needs of the patients is OFNHP 5017's purpose. OFNHP 5017 supports legislation that will improve access to all health care. OFNHP Local 5017 supports HR 4903. 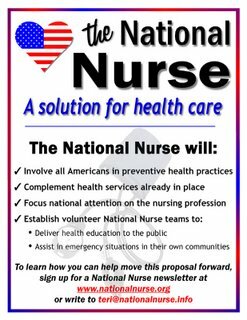 It is all the more amazing, then, that nurses, without the aid of professional lobbyists and with virtually no budget, launched a thriving grassroots campaign to create an Office of the National Nurse for America. Thus far, the campaign has led to the introduction in 2006 of a National Nurse bill in the House of Representatives and a great deal of interest among elected legislators. At the close of the 2006 legislative session, the bill had bipartisan support with 42 members of Congress signing on as cosponsors, a remarkable achievement. Many of you may be looking at the National Nurse website for the very first time and may want more information about the efforts to legislate an Office of the National Nurse. Please read the proposal that members of the National Nursing Network Organization submitted to Congress. HR 4903, The National Nurse Act of 2006 received the co-sponsorship of 42 members of Congress. 1. Submit your email to receive the weekly emailed newsletters. They are free and provide you an update with the progress and activities surrounding the campaign. 2. 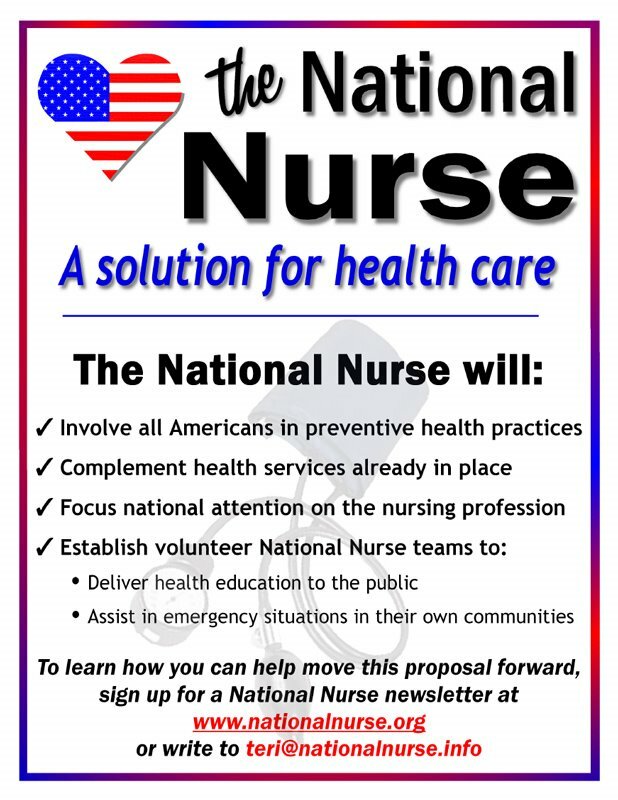 Email Teri to receive a free poster and/or visit Cafe Press to purchase a button or bumper sticker to increase awareness about the effort to establish an Office of the National Nurse. 3. Sign the on line petition to show your support. 4. Join the $20 campaign. 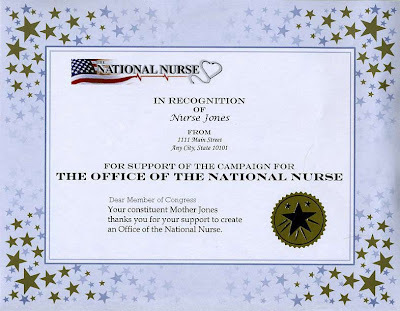 If you make a $20 donation either on line (or you mail email teri@nationalnurse.info to learn where to send a check) a certificate in your honor, just like the one at the top of this post, will be placed into a packet that will be delivered to your member of Congress in support of a National Nurse. We will also send you an identical certificate in the mail. The National Nurse is a 501 C-4 and has been established as a legislative advocacy corporation, therefore, your contributions are not tax deductible. 5. If you have an interest in writing about the proposal to establish an Office of the National Nurse or you are a graduate or undergraduate nursing student choosing this as your class project, please send us an email also. 6. Share your ideas, suggestions, and opinions!! They matter and are often integrated into future endeavors. On Saturday, February 3, 2007 the American Diabetes Association sponsored Diabetes Expo, that took place at the Oregon Convention Center. When the doors opened at 9 a.m. there were over 500 people in line waiting to participate. 20 second year nursing students from Portland Community College volunteered and reported that people were eager to learn how to take better care of themselves and their families. The mission of the American Diabetes Association is to prevent and cure diabetes and to improve the lives of all people affected by diabetes. The Expo provided an opportunity for Oregonians to receive education on pre-diabetes, nutrition, weight management, and activities that lead to a healthy life style. There were written materials available that were printed in English as well as Spanish to increase everyone's literacy about ways to live healthy. Imagine if Diabetes Expo fairs were happening simultaneously across the nation run by volunteer National Nurse Teams. Accurate information from a credible source is instrumental in keeping our citizens healthy and preventing unnecessary disease. Think Diabetes Expo Fair times thousands. Nurses have the power and the knowledge to make a difference. Join the National Nurse Campaign and help us do exactly that! YES, YES, YES, we need a National Nurse. Nurses are the most trusted profession in the United States according to nearly every Gallup poll done. Our contribution to health care is invaluable and our ability to empathize and relate to the public is second to none. A National Nurse is a great way to not only improve the health of the nation but to promote the profession of nursing as well. After all, how many lay people REALLY know what nurses do? An excellant article. She evidently knows what she is talking about. Very intelligent.